In 1883, railroad financier Henry Villard brought Portland and the Pacific Northwest their first transcontinental railroad. Earning a reputation for boldness on Wall Street, the war correspondent turned entrepreneur set out to establish Portland as a bourgeoning metropolis. To realize his vision, he hired architects McKim, Mead & White to design a massive passenger station and a first-class hotel. Despite financial panics, lost fortunes and stalled construction, the Portland Hotel opened in 1890 and remained the social heart of the city for sixty years. While the original station was never built, Villard returned as a pivotal benefactor of Union Station, saving its iconic clock tower in the process. 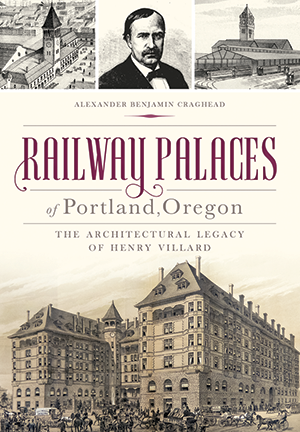 Author Alexander Benjamin Craghead tells the story of this Gilded Age patron and the architecture that helped shape the city's identity. Alexander Benjamin Craghead, MS (architecture), is a historian of design and place, and teaches at UC Berkeley.